Some light relief is definitely needed right now. 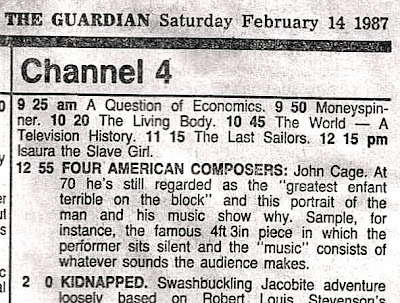 So, both as proof that the paid-for media has been getting it wrong for many years and in reluctant recognition of the Cage centenary, I reblog the gem above. It first appeared here in 2008 under the title Music for prepared organ, and thanks go to reader John Shimwell for sharing it with us. 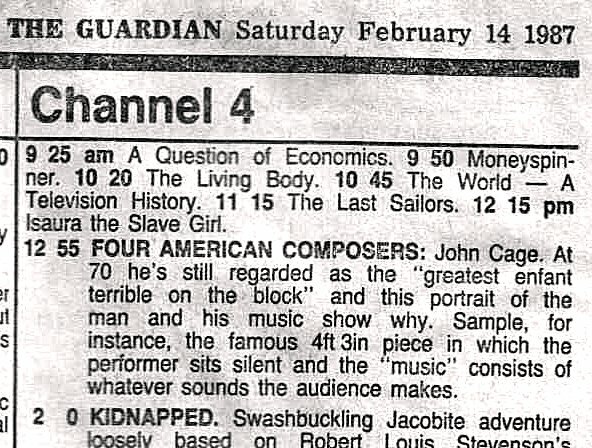 And staying with things Cageian, which topical composer when asked, "What do you think of John Cage?" replied "I don't think of John Cage."? Elliott Carter, not terribly surprisingly. But I have Dickinson's book of interviews about Cage on my shelves, so no brilliant insight on my part. This reminds me rather of a long piece I read recently about Pierre Boulez. I think it was the much-missed Morton Feldman who said something similar about him, although reading the comments on Boulez made by eminent composers of the past sixty years, one was hard put to find one who had anything good to say about him. Both musically and personally, Boulez is plainly not what one might call a clubbable man, but I was still rather shocked at his isolation, albeit he did that to himself. I am moved now to seek out anything Carter said about Boulez and Feldman about Cage.